You are undergoing a gigantic leap in spiritual evolution! Your physical body is transforming into a light body. Do you remember the story of the transfiguration of Jesus? As reported in the New Testament, Jesus and three of his disciples went up to a mountain-top. There Jesus suddenly was transfigured. He became radiant. His face and garments began to glow with white light. The prophets Moses and Elijah appeared on either side of him, as his disciples watched in awe. In that moment, Jesus became a being of light. All of us are now gradually undergoing this same kind of transformation. Until now, the light within us has been dim, like a dimmer switch turned way down. Maybe that's why we have lived in fear, ignorance, and greed throughout human history. Eons ago, we dwelt in light bodies in the spirit realms. Then, at some point, we decided to descend into the physical dimension. We wanted to experience the adventure and sensuality of it. But to do this, we had to lower our vibration in what is now called “the fall of man.” We created physical bodies in order to live and function in the physical dimension. We then put ourselves into these bodies. We gave up our existence in the spirit realms in order to experience the physical world. But soon, we forgot we did this. We forgot what we really were and why we decided to come here. We began to believe that we are the physical bodies we inhabit. We began to reincarnate again and again in physical bodies. So what is a light body? In appearance, a light body may resemble a physical body. But in composition and properties, a light body is vastly different from a physical body. A light body is radiant and normally translucent. It sparkles and glows with white and violet color. It holds an enormous quantity of light compared to a physical body. It may be invisible to our physical eyes because of its high rate of vibration. A light body possesses other qualities not available to us in our physical bodies. For example, a light body is impervious to disease and environmental threats. It cannot be injured, nor can it age and die as physical bodies do. It thrives on light rather than food. It cannot hold negative emotions like fear and anger within it. In a light body, we are much closer to the divine. In his book The Celestine Prophecy, author James Redfield describes the future of human evolution. He says, if we choose, we will be able to raise our vibration to a such a level that we actually become invisible to those who do not raise their vibration. We will be able then to cross the barrier separating us from the spirit realms at will. But to maintain this level of vibration, we will need to overcome our fear. During meditation, I have often traveled to “the other side of the veil.” There I have encountered beings of light. These beings of light have normally taken on what appears to be a physical form, thus allowing me to relate to them in the same way we relate to each other through our forms here in the physical world. But on one occasion, my spirit guide allowed me to see him as he really is -- a being of light. And in that same moment and to my surprise, I also saw myself as a being of light. For most of us, the transformation from a physical body into a light body is a gradual process. A combination of personal effort and divine grace seem to bring it about. This divine grace is showing up in the form of vast amounts of light now pouring into the Earth. This inflow of light is leading to changes in our cells and DNA, allowing us to hold more light within our physical bodies. As the upgrade continues, we may feel a sensation of electrical current or vibration. We can accelerate our transformation into light bodies using the many spiritual practices available to us -- practices such as meditation, chakra work, creative visualization, elimination of toxic substances from our physical bodies, and energy exercises like chi gong, just to mention a few. At the beginning of every Spirit Quest meeting, we do a simple energy exercise designed to bring more light into us. I do this same exercise when I wake up every morning. When we seek enlightenment, we are, in effect, activating our light bodies. And as we continue to do this, many of us will choose to become light workers, striving to bring even more light into the world. Thank you Roy, I am experiencing the journey of an enlightened being day by day through beings like you who are "light workers" and share light with anyone who is open. So amazing, I wish I can activate my light body too, can any body teach me ? 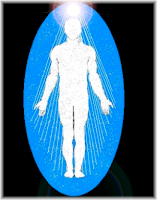 I saw an energy body / Light body . with my Mom . Then I saw here energy body .